Want to remind customers to write a review? Send an invitation reminder to encourage people to give you feedback. Send invitation reminders to customers who didn't respond to the original email invitation. By activating the invitation reminders feature, you'll offer customers another opportunity to leave a review. Invitation reminders can increase your current conversion rate by up to 35%. 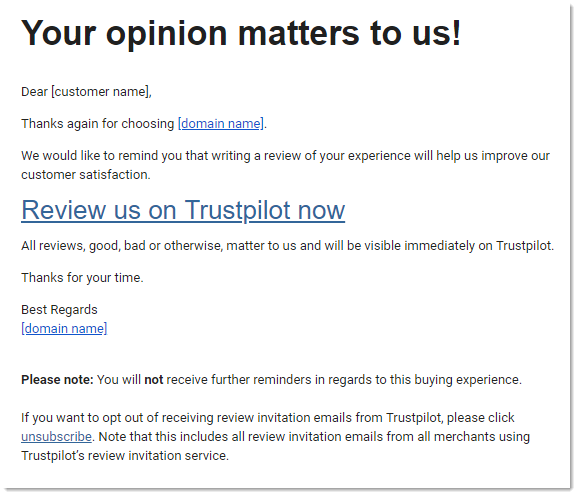 In Trustpilot Business > Get Reviews > Invitation Settings > Timing and frequency, enable Invitation reminders. In the drop-down menu, set the delay period for the reminder, then click the Save changes button. The reminder will be sent from your original sender email address if a customer hasn't posted a review after the delay period has passed. The content in the Invitation reminders template cannot be customized, and it uses the same language settings as the optimized invitation template. Note: If you disable Invitation reminders, no scheduled reminders will be sent.